For the longest time I said I'd never do a tutorial. Then, after that, I said for the longest time that I would, but I never got around to it. Even though it was a long wait, my first is complete and others are on the way. 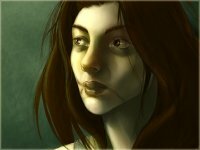 Link: CG Tutorial - "Janet"
This tutorial guides you through the steps of taking a finished pencil or inked drawing to a full color CG painting. I use Photoshop 5.5 for the entire thing and have no intention of switching to a different version any time soon, so for those of you with earlier or later versions, your shortcuts and methods might need to be adapted. You'll need to be at least basically familiar with Photoshop's layout and tools, but for the most part anything beyond beginner level is explained. Do they frighten you? Confuse you? Draw your attention so fast that you end up with whiplash while walking down the street but you still can't paint them to save your life? While this was supposed to be a simple tutorial on breasts alone, it's become a project unto itself - delving into the differences in male and female anatomy and showing how different sizes and attires affect their look and position.